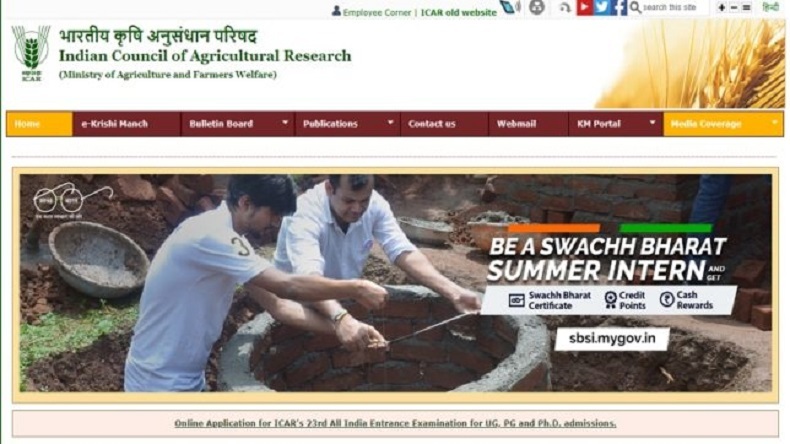 ICAR AIEEA Admit cards 2018: Indian Council of Agricultural Research (ICAR) has released the admit cards for AIEEA UG / PG / SRF examination on its official website. Candidates can download the admit cards by logging into icar.org.in. ICAR AIEEA Admit cards 2018: Indian Council of Agricultural Research (ICAR) on Tuesday released the admit cards for AIEEA UG / PG / SRF examination. The registered candidates can apply for the same on the official website of ICAR @ icar.org.in. The All India Entrance Exam for AIEEA-PG courses is scheduled to be held on August 18, 2018, and ICAR will be conducting AIEEA-UG courses on August 19, 2018. Candidates who are going to appear for ICAR re-exam 2018 for the UG programmes can also download admit cards on the official website of ICAR. The Indian Council of Agricultural Research (ICAR) is an autonomous body responsible for coordinating agricultural education and research in India. It comes under the Department of Agricultural Research and Education, Ministry of Agriculture.